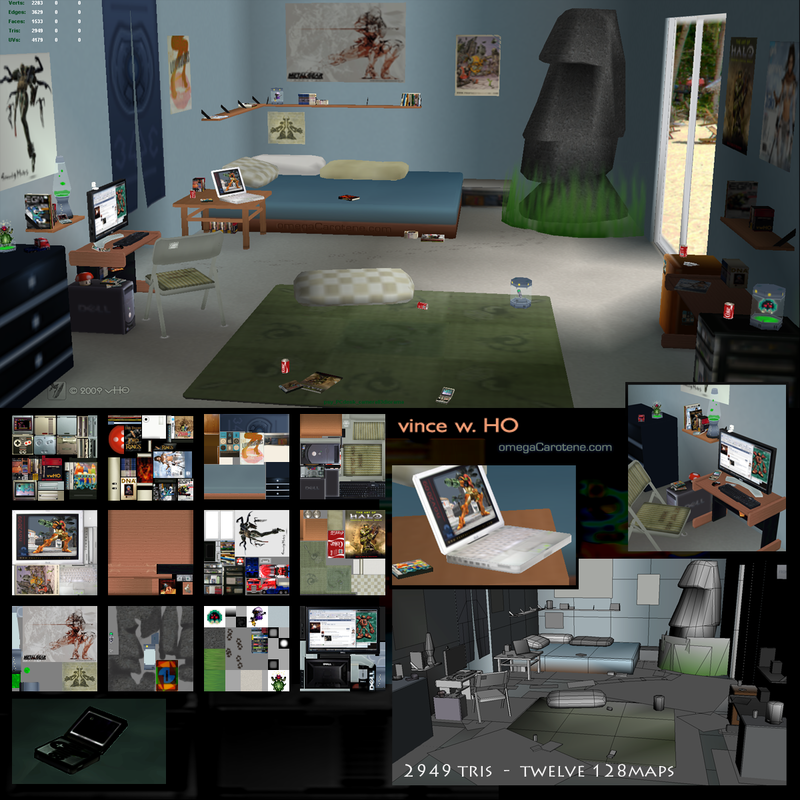 here we have what is essentially a geekified version of my room, modeled in Maya and mapped with 128×128 textures (think Nintendo 64 era graphics). while i do (irl) have a habit of making my bed everyday, the bed is admittedly a bit spartan. i think all of my cast shadow are way on the light side, too; the whole thing could certainly benefit from some ambient occlusion baked-in. and the rug design is too light to read as any intelligible image. the shelves on the wall need some cast shadows. there’s some oddness to the grass around the base of the Moai in the corner…it could use a couple mounds of dirt around there—and speaking of the Moai Ester Isle head, there’s no friggin’ way that the architectural structure of an average Spanish-style house in the Bay area could support that kind of weight on the second floor… sweet mother of—someone hand me a Gravity Hammer, now! we’re tearing this puppy down! how many game/geekery characters or icons can you spot in the room above? This entry was posted in games, [oC]-designs and tagged 3D modeling & texturing, games collision, Geek, maya, omegaC, sackiCons, textures, video games. Bookmark the permalink.